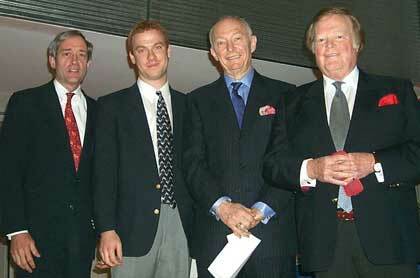 From left: Columbia University President George Rupp; Columbia College junior Jonathan Lemire, a Roone Arledge Scholar; Professor Richard Wald, the Fred Friendly Professor of Journalism; and University Trustee Roone Arledge, chairman of ABC News. Columbia has named the state-of-the-art auditorium and cinema in its new student center for Roone Arledge, CC'52, the ABC News chairman and University Trustee. At a ceremony on Tuesday, April 25, which included a video tribute to Arledge prepared by ABC, the University hosted a gathering of 350 students, alumni, friends and family to formally dedicate the Roone Arledge Auditorium and Cinema. "It is wonderfully appropriate that this auditorium will always bear the name of the alumnus who lifted sports entertainment to blockbuster proportions and then moved on to earn the further respect of his colleagues and viewers by treating the delivery of news as a high responsibility," said Columbia President George Rupp. "In an era when the line between news and entertainment is too often blurred, Roone Arledge's concern that the evening news should ideally be protected from ratings competition speaks volumes about his sense of purpose, his character, and his vision." "Columbia, now as it did when I was here, has chosen to focus on its students," said Arledge. "There was a need for a place for people to gather, for ideas to circulate, for people to bounce them off each other. I hope this will be a place where that kind of stimulation can take place." Jonathan Lemire CC'01, who holds a scholarship that Arledge has endowed, said: "His gift of this space will greatly enhance the lives of Columbia students for generations to come." The guests included at least two of Arledge's classmates at Columbia, Richard Wald, also a colleague at ABC News and now Fred Friendly Professor at Columbia's Graduate School of Journalism; and Max Frankel, former executive editor of The New York Times, and now a columnist for the newspaper. Over 200 undergraduates attended the event, representing Arledge's interest in theater, performing arts, journalism and athletics during his student years. Since its opening at the beginning of the school year in Columbia's $85 million student center, the 1,500-seat, 11,700 square-foot Arledge Auditorium has quickly assumed a place as the principle venue for major events on the Columbia campus. Reflecting the diversity and dynamism of campus life, the auditorium has been the scene of hundreds of events, one almost daily, including recent speeches by former Senator Bill Bradley (before he abandoned his presidential campaign) and Senator John McCain (after he had ended his White House run), a conference on Black Feminism, a Town Meeting organized by the Securities and Exchange Commission as well as a student activities fair, a celebration of the Chinese New Year and University Orchestra concert. "Our campus was in great need of a central, large space that was flexible enough to accommodate the extraordinary array of events produced in this very active community," explained Harris Schwartz, Executive Director of Lerner Hall, "And at last, the Roone Arledge Auditorium provides this." The hallmark of the space is its versatility. Flexible seating and a moveable wall allows for different events at the same time and/or accommodations to attendance. The recent opening of the Roone Arledge Cinema, with technologically advanced equipment and systems, further increases the flexibility of the space. The cinema is a large balcony featuring raked seating for approximately 400. The balcony can be closed off for use as a movie theater or opened to increase seating to the full 1,500 capacity. Arledge became chairman of ABC News in 1997 after serving as the network news president. Widely hailed as a broadcasting pioneer, he was credited with innovations in sports coverage, including the instant replay and slow motion, during his years as president of ABC Sports. As news division president, he was responsible for programming that includes "World News Tonight with Peter Jennings," "Nightline," "20-20" and "This Week." A member of the Television Academy Hall of Fame, his shows received 36 Emmy Awards and 20 Peabody Awards. At Columbia, Arledge received the College's John Jay Award in 1979, followed by its highest honor, the Alexander Hamilton Medal, in 1998. He was presented the Gold Baton at the Alfred I. duPont-Columbia University Awards in 1995. Arledge is serving the second year of a six-year term as University Trustee.